We take the health of our goats very seriously, especially after seeing what a big difference quality hay, grain, and supplements are. Our management is a huge expense, but in the long run is very beneficial. Switching to higher quality feeds, we have noticed a large difference in their overall condition, immune systems, parasite resistance, production, and overall health. Make sure you do your research and have a good mentor to help you learn, especially ones in your area. I would really like to thank Gila from Honey Meadows, Teri from Pocket Sized, and Cheryle from Old Mountain Farm. All wonderful breeders that answered my many questions and still do. All very informative and I would recommend all of them if wanting to start a herd of your own. During the warm months, we have our goats in a large grassy run. Because of our very small herd and past fencing problems, we currently use chain-link panels. They have plenty of space to forage, jump on rocks, and care for their kids. The bucks also have their own separate run, far from the does. All goats are closed in their barns for the night, the does have a 20 by 10 and the bucks have a 10 by 10. For bedding, we use shavings/hay mixture for it to be less costly but still effective. We lay lime and DE on the floor of the barns before we put the shedding down to keep odors and parasites down. During the cold, winter months, the does are spoiled and get to go in our "glasshouse". It stays above 50 degrees, so it is easier for us to care for them and their later young. They are definitely appreciating their special housing this year(2014), seeing over 30 inches of snow through their windows! We provide proper ventilation in the glasshouse and only let them out during warmer days. The mature bucks, to their disadvantage, have to toughen through the cold months in their outside barn but are provided more feed to fulfill their needs for the winter. Our goats always have a full supply of water available to them daily which has a splash of Apple Cider Vinegar. During the winter or cold days, we like to give them “goat tea” (warm water) that we heat up for them on our wood stove. 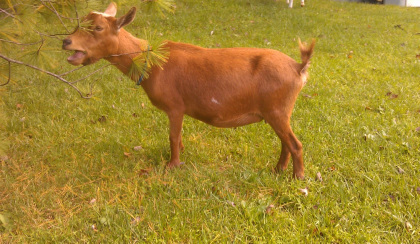 Our goats receive quality grass hay. It is of a luscious dark green color and very leafy. A good quality hay is very important and our goats love the hay we give them. 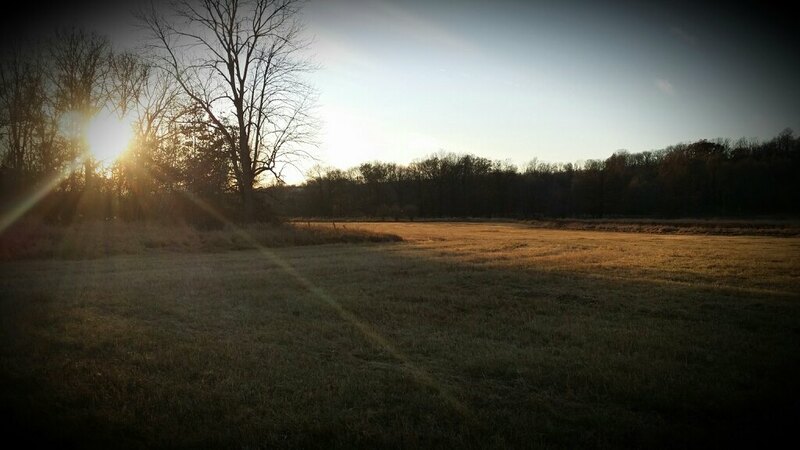 We purchase our hay locally and they take very, very good care of their fields. We also supplement our goats with alfalfa pellets, specifically milking does and bucks during rut. All of our goats are fed Purina Noble Goat Chow which is medicated with Decoquinate for prevention of Coccidiosis and contains Ammonium Chloride to prevent urinary calculi in bucks. If we are drinking the milk from the does, then we gradually switch them to Blue Seal Dairy Pellets which is not medicated so it the milk is safe to drink after the waiting period. All lactating does receive black oil sunflower seeds, shredded beet pulp, barley, alfalfa pellets, oats, and flax seed to help fulfill their extra dietary needs. This also makes for better tasting milk in larger quantities, a large plus. Dusty, the dog, looking at the newborn kids. We copper bolus our goats every 4-5 months, sometimes even 3, depending on the goat's needs. We also give Selenium/Vitamin E gel every 4-5 months. 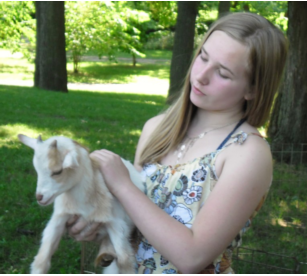 We try to deworm our goats to a minimum by constantly checking their eyelids and seeing if the deworming is necessary. Generally, though, we deworm them every 4 months(more or less) depening on the goat and herd's status. We always deworm the doe after the kids are born. 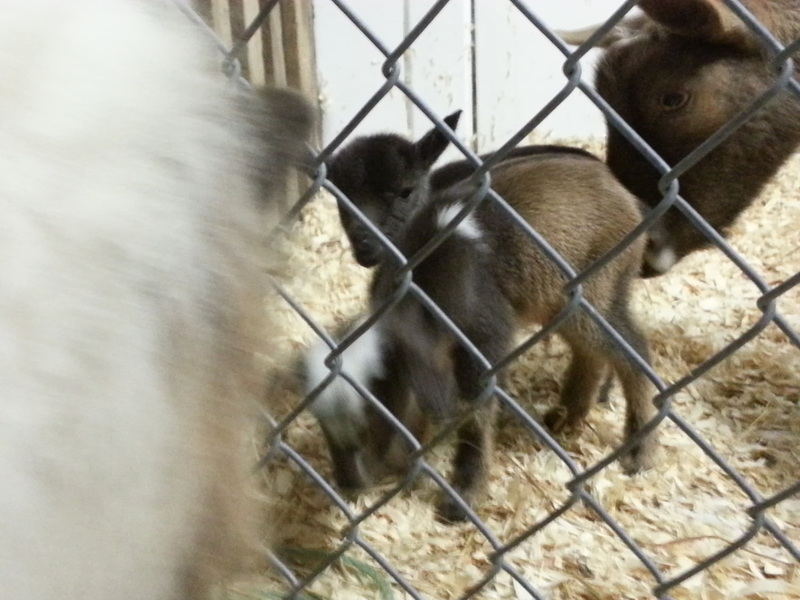 We test our goats yearly for CAE, CL, and Johnes. We also purchase our goats from closed herds that also test their goats.